Two-time champion and overwhelming favourite Jones, 31, picked fellow American Smith apart to earn a unanimous decision. 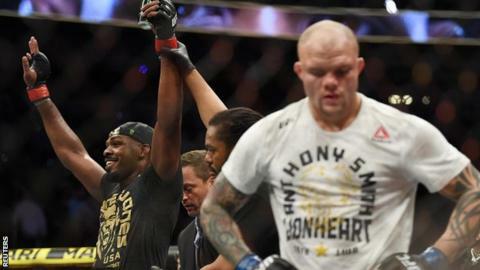 Jones dominated all five rounds of their main event bout, comprehensively outstriking and outgrappling the 30-year-old. Despite receiving a two-point deduction for an illegal knee in the fourth round, Jones won by a wide margin, with all three judges scoring the bout 48-44 at the T-Mobile Arena. Victory extended Jones' undefeated record in world title fights to 13 as he successfully defended his title for the first time since recapturing the belt from Alexander Gustafsson at UFC 232 in December. "Hats off to Anthony Smith," Jones said. "Now I see why they call him 'Lionheart'. "I have never had someone talk to me while I was hitting him. This guy is so durable - he's like a Terminator. He did a great job." The fight did not match Jones' vintage displays during his previous world title run, and he admitted he did not deliver the performance he hoped for. "Man, this MMA thing is really hard," he said. "Some days you're going to look amazing and some days at work you're not going to perform at the level you hold yourself to. Before UFC 235, Jones hinted at a move up to heavyweight to face old foe and current champion Daniel Cormier for a third time. But after beating Smith, Jones suggested an extended stay at light-heavyweight could be an option - with a new crop of contenders, led by Brazilian knockout artist Thiago 'Marreta' Santos, beginning to emerge. "Right now I'm going to enjoy this win, go back to the drawing board and figure out ways to get better," Jones said. "There's a lot of young talent in the UFC - so many guys coming up, so many guys that are looking unbelievable - and that's going to be such a challenge in itself." In the night's co-main event Nigeria-born Kamaru Usman produced the performance of his career to dominate long-reigning welterweight champion Tyron Woodley and become the first African-born world champion in UFC history. Usman, 31, extended his winning streak to 14 and maintained his unbeaten record in the UFC. "I might not be the best striker in the world and I might not be the best pure wrestler in the world," he said. "But when it comes to mixing it up, I'm the best welterweight on the planet right now." It proved to be a mixed night for Brazilian light-heavyweight striker Johnny Walker. The 26-year-old headed into his short-notice fight with Canadian Misha Cirkunov having scored quick knockout wins in his past two bouts. The crowd-pleasing Walker added another spectacular finish to his record as he finished the number 14-ranked contender with a spectacular flying knee after only 36 seconds. But Walker was soon red-faced with both embarrassment and pain after dislocating his left shoulder when he attempted 'the worm' dance move to celebrate. Ben Askren produced a thrilling come-from-behind victory on his UFC debut against former UFC champion Robbie Lawler. American Askren, 34, was slammed to the canvas and battered with heavy ground strikes as Lawler threatened to score an early stoppage win, but recovered admirably and locked up a bulldog choke to force the end of the contest. Lawler protested against the first-round stoppage, while former US Olympic wrestler Askren teased UFC president Dana White by asking: "Is that the best you've got?"